Kiyonari 12th in Race 2, Camier involved in a Superpole race incident and declared unfit to race. 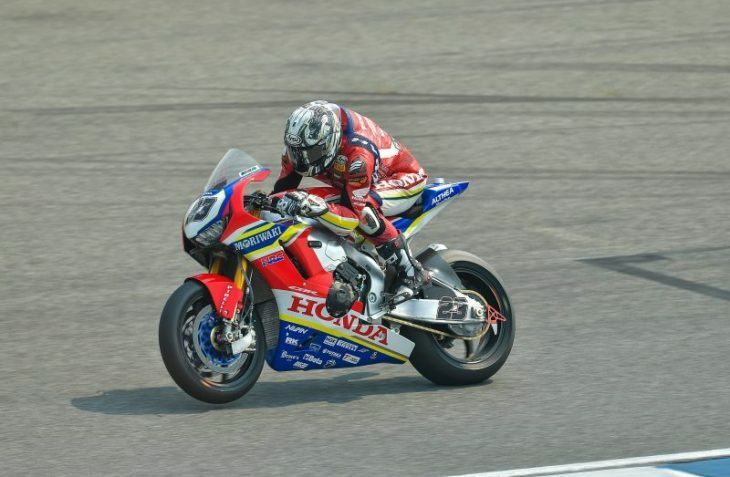 Ryuichi Kiyonari scored a twelfth-place finish in Race 2 at Buriram today after a DNF in the Superpole race. The Japanese rider was satisfied to have finished the race inside the points zone, but he’s looking forward to taking another step forward in terms of both his riding style and the bike’s setup.After suffering a crash during lap seven of the Superpole race following a collision with Thitipong Warokorn, the Thai rider unfortunately impossible to avoid as he crashed just ahead of him, Leon Camier hit his right knee hard and was subsequently declared unfit to take part in Race 2 by the Medical Centre. The Brit will undergo further medical tests once back home in Andorra. “Let’s start with the positive part of this weekend, which is the fact that we made a little progress both in terms of my feeling with the bike and my lap times. Not as much progress as we want of course, but we have been fairly consistent. Unfortunately, I didn’t have the same feeling during the race and I felt very frustrated. I just kept trying and doing my best, but I cannot say I’m satisfied with my race weekend. I’ve felt great support over the weekend from our fans, everyone in the team and in Honda and I want to repay them all with more than this. I have understood more about certain aspects which I hope will allow me to improve both my riding style and my bike setup. I’ll continue working hard to improve”.